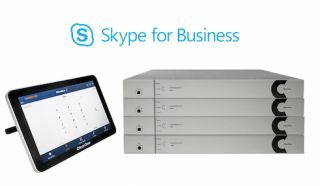 Following on the heels of last year’s announcement that Skype for Business is now available on its COLLABORATE Pro product line, ClearOne (NASDAQ:CLRO) introduced a system upgrade that allows the CONVERGE Pro 2 48V, 128V and 128VD DSP Mixers to support built-in Skype for Business client for installed audio conferencing applications. The announcement was made at ISE 2018 in Amsterdam in Stand #1-N120. Skype for Business in CONVERGE Pro 2 VoIP units is available through a free upgrade for the software and firmware, and doesn’t require any changes to the hardware. It works with both cloud and on-premise Skype for Business Servers, and is compatible with all other Skype for Business clients. Skype for Business allows for point-to-point audio conferencing, multi-party audio conferencing, and access to a complete call history. Additionally, there are new and separate CONVERGE Pro 2 Dialer applications for Skype for Business that are available on Android and the Touch-Panel Controller. The Integrator can choose to configure the CONVERGE Pro 2 units for regular SIP based VoIP conferencing or Skype for Business conferencing.